No software needed, just plug in your sticks and get connected. Nothing to configure, simply plug the “Home” Miracle Stick into a USB port of any PC* and take the “Away” Miracle Stick with you. 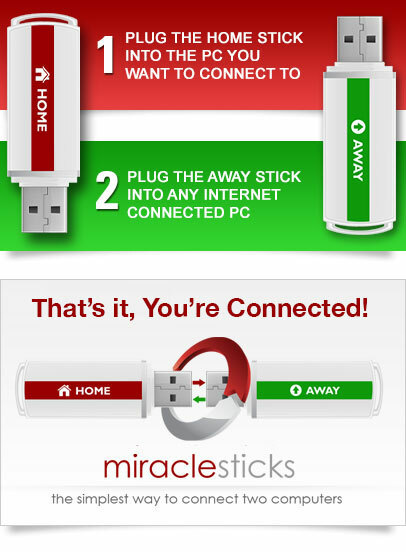 Plug the “Away” Miracle Stick into any internet connected PC* and you instantly have access to your “Home” PC. Hassle free access to files and applications on your home or office PC while you’re traveling. Providing technical support in an instant; both users can follow along in real time. Monitoring your children's online activity and keep them safe from online predators.